The Seward Lady Saints used 42 percent shooting from three point range to sink Air Force Prep (0-3) 75-60 Saturday night at the Green House. The 3-0 Lady Saints made 11-26 three pointers in the win to wrap up the Pepsi Classic. Anete Kirsteine scored 18 points and grabbed six rebounds while making four three pointers. Ashlynn Knoll scored 16 and pulled down six rebounds. Payton Fleming scored 11. Seward didn’t play as well as they did Friday night. 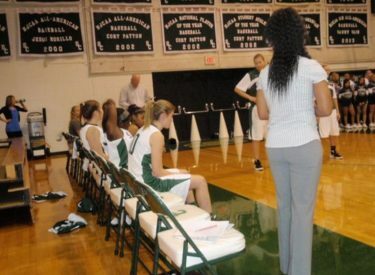 The Lady Saints committed 28 turnovers. Air Force Prep made only 11-26 free throws. Their losses are to Northeastern, Garden City, and Seward. The Lady Saints leave Wednesday for Marianna, Florida and play Monroe, Florida Thursday at 2 p.m. and face Tallahassee Friday at noon.